Released in 2010 and highly expected, yorlga is an image album, a dream mash-up between composer Yoshitaka Hirota of Shadow Hearts fame, and vocalist Noriko Mitose, well known in the game music community for her performance in Chrono Cross‘ “Radical Dreamers.” The two previously collaborated on the multi-composer original album Message and Ar tonelico III‘s final battle theme, “XaaaCi,” a piece highly reminiscent of the composer’s older works. How does the duo perform when an entire album is devoted to them? The album opens with “The World is a Movie Inside My Eyes,” overall an enjoyable, though somewhat derivative, J-pop-styled track. The very opening brings back memories of Shadow Hearts‘ “ICARO” theme, though the track quickly segues into a more traditional composition, with the aforementioned making brief appearances from time to time. There’s an impressive violin solo serving as the bridge, very reminiscent of some of the composer’s famous works. Besides for these noteworthy parts, the track is held together by its rather poignant though upbeat melody and quite enjoyable instrumentation, between the guitar and percussion. “Jewelry Boat” is calmer and more subdued, featuring little more than a piano, guitar and the singer, the latter being layered in several parts, to great effect. There’s a neat instrumental bridge where the beat speeds up and a slower violin (compared to the previous track) is brought in. The violin and beat stick around past the bridge, allowing for a much welcome added complexity to the piece. With the former the melody really begins to shine, as it provides some quite enjoyable counterpoint. The piece ends with another graceful violin solo. “We’ll Buy Your Dream” is far more reminiscent of Hirota’s more unique works on the Shadow Hearts series. The whole track, perhaps hinted at by the title, has an almost lucid dream-like quality to it thanks to its instrumentation, which includes a guitar playing a haunting series of chords and an electronic voice in the bass that sounds nondescript, somehow melding into the back of the listener’s mind as the song progresses. Mitose’s vocals here sound more like strained whispering, fading in and out of reality. It’s quite a neat effect that fits the air of the piece quite well. All of these qualities superimposed upon one another create a very odd mix that leaves the listener fascinated and slightly unnerved. 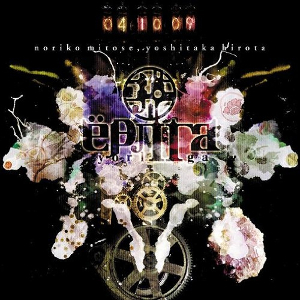 “What Lurks at the Bottom of Another World” is somewhat more of a traditional piece, though the dark instrumentation still smacks of Hirota’s unique style. The electric guitar and thrumming bass create quite an interesting framework for the piece, and the guitar and occasional staccato electric organ help support Mitose’s vocals, here a great deal more active than the previous two tracks. “Circulation” is one of two, shorter, instrumental tracks on the album. The track slowly builds in intensity, and soon breaks out into a rather catchy rhythm which persists until the piece’s end. “Blossom-Falling Night” is an intensely enjoyable track that opens with a rising violin movement that feels like a curtain opening for the main act. The violin and vocals mesh wondrously well throughout the track, the latter describing a nostalgic, uplifting melody that brings a smile to the face. The violin’s opening performance comes back from time to time, always implemented well into the song’s larger framework. “Suzhou Nocturne” has a very unsettling opening. Noriko Mitose sings in an almost baby-like voice over what can only be described as a white noise, with occasional crackles. Soon the white noise dissipates and the song it was masking comes to light. Mitose’s voice feels much more full and mature now, accompanied by drawn out chords in the organ. Soon a beat starts as the singer’s voice fades, and piano chords are heard in the bass. Mitose makes a brief appearance a bit later on, as well. The piece overall is gentle, but almost deceptively so, sounding like a lullaby in a horror movie. “Narcolepsy” features, throughout its entire length, a very high pitched tone that can quite easily give the unassuming listener a headache — fortunately a malady this reviewer is spared from so that the song can be enjoyed fully. The piece has a very neat percussive line, and is supported instrumentally by a vibraphone-like sound and, as it progresses, strings. Mitose’s voice is layered and sounds quite wondrous. The bass soon kicks in, adding to a real driving force behind the melody. The tone is entirely a love-it-or-hate-it affair. On the one hand it’s quite creative and unique, as is the composer’s style, on the other it may very well make the piece entirely unlistenable for some. “Prayer to Heaven” starts with an unassuming tap on a triangle, a little marker that shows itself from time to time as the piece continues. This piece certainly feels somewhat like a prayer, with more emphasis put on the vocal work, with two distinct voices singing in counterpoint to one another, one serving as the melody, the other mostly as soft, supporting staccato. The melody opens up as the piece progresses, and the vocals, along with the supporting strings, creates quite an ethereal, soothing track that is very easy to listen to. “Fox-Possession” has a distinct Asian vibe, though the bass helps make the piece sound quite akin to the Asian pieces form the Shadow Hearts series. The violin comes in after a glissando on a sudden piano, at which point the piece feels as if it came straight out of a title from the aforementioned series. There’s a very impressive, though short, violin solo at one point as well. “U.M.T.,” the second of the two instrumentals, is an even briefer, simpler piece than the last one, serving more as a bridge between the two songs than anything else. It’s merely a simple, ephemeral piano piece. The closing and title track, “yorlga <Sleep Crystal>” works quite wonderfully to finish the CD. It’s a softer, calming track, thanks to the piano and strings, and soothing vocals. It seems that Hirota was trying to recreate the vocal themes form the first two Shadow Hearts titles, though those two tracks are certainly more memorable. This piece still has a fair amount of charm, however, and it’s great to listen to. The staccato violin in particular works wonders for the track. The purchase of this album should come as a no-brainer for anyone interested in Hirota’s work. Each track offers a new style to bring to the table, some new, some old, and all enjoyable. For those unfamiliar with Hirota’s style, this is likely one of his more accessible works, though there is still plenty to turn off someone expecting something less… experimental. Overall, this album is an excellent achievement for Hirota, though not quite as memorable as his most notable works. Posted on August 1, 2012 by Marc Friedman. Last modified on January 13, 2017.